A healthy scalp requires essential nutrients & hydration, but harsh chemicals may can easily strip this away, damaging hair and causing dandruff. Don't let this stand in the way of you owning the room! Now, you can bid a definite farewell to your dandruff with regular use of New Pure Derm Anti Dandruff Shampoo - the Dermats# recommended solution for recurring dandruff**! Infused with the goodness of Rosemary and Tea Tree extracts, along with Oxy-fused Micro Bubble Technology, Pure Derm Anti-Hairfall Shampoo removes upto 100% dandruff and prevents it from coming back**. *Purification from dirt, grease and dandruff, action at epidermal level, effectiveness of dandruff removal depends on dandruff level, no visible flakes with 4 weeks of daily product use. Infused with Rosemary and Tea Tree extracts, it reduces hair fall by 97%^. op more Pure Derm products here. 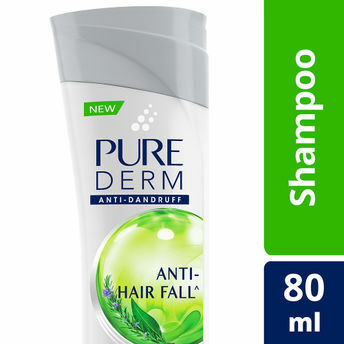 Alternatively, you can also find many more products from the Pure Derm Anti-Hairfall Shampoo range. Explore the entire range of Shampoo available on Nykaa. Shop more Pure Derm products here.You can browse through the complete world of Pure Derm Shampoo .Alternatively, you can also find many more products from the Pure Derm Anti - Hairfall Shampoo range.